Since I've been slowly stocking up on things like garlic & squash from the farmers market we didn't need that much this week. 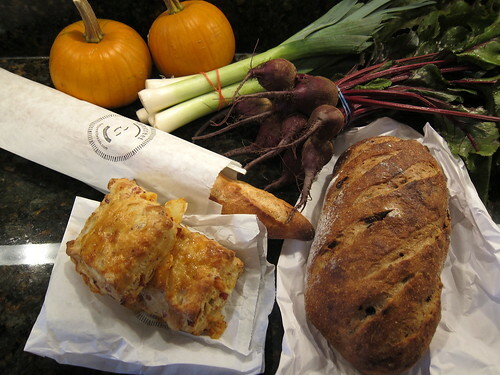 Our market, the Kingfield Farmers Market, is one of the latest running farmers markets in our area but we only have one weekend left & the holiday market on November 13th before it is over for the year. Smoked Salmon Chowder - trying finishing it off with a little cream cheese this time. Pumpkin Guts - You've got to come back for this one. Sausage & Peppers over Grits - Our typically recipe for the sausage & peppers but trying it over grits is new for us. Sweet Potato Hash with Eggs - Based on some amazing hash we had at Corner Table. Recently, we were sent some coupons to try Ghirardelli's new Luxe Milk chocolate for free. We tried both the hazelnut & almond. Even though I prefer dark chocolate, this is some of the best milk chocolate I've had. Now we have some coupons to share with you because chocolate is the perfect halloween treat, right? 1. Two winner will each receive a coupon to get either a box of Luxe Milk squares or a Luxe Milk bar for free as well as two more coupons for $1 off another box or bar. 2. Comment on this post to be entered to win. 3. Twitter this giveaway & let us know you did in a comment. 4. We must be able to email you if you are picked as the winner so make sure to leave an email address! 5. The coupons are only good in the US, sorry. 6. The winner will be picked on Halloween. 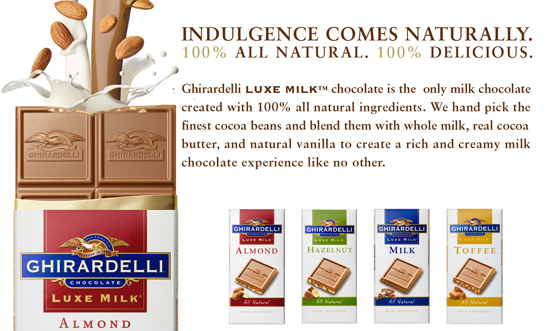 Disclaimer: We were sent coupons from Ghirardelli to use ourselves & to giveaway. We were also sent some of the Luxe Milk squares through the Foodbuzz Tastemakers Program. We were not paid in any other way to write about this product. What a great post! How much fun is this #GreatHallowTweet ? LOVE the looks of your mantle BTW. Very scary indeed! I'll be following your posts all week. Can't wait to see what you come up with next. I would love to have a ham and swisscuits biscuit - and the name is so cool too. Putting the chowder in my to try pile of recipes. Nice, Kat! Love to see a giveaway on the #GreatHallowTweet, too - and what a Treat! Yea chocolate! 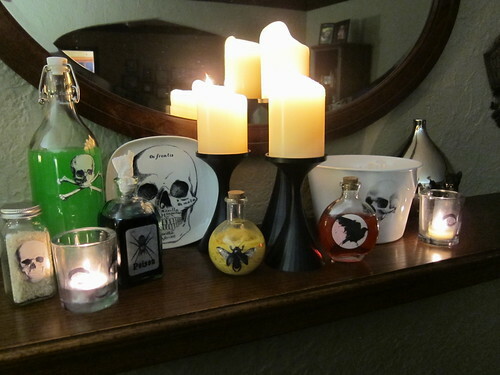 And fantastic decorating, with the candles and skull dishes. I'd love to be entered in the giveaway! This chocoholic would love to win. I would love to try the chocolate! I am a big milk chocolate fan and enjoy sampling all sorts of brands (but haven't seen this one available in local stores yet!). pumpkin guts sounds so fun! i can't wait to see the recipe. I would love me some chocolate!! I would even share my chocolate if I won! How did I miss your giveaway? I have been so into quilting that I have neglected visiting my favorite blogs. I love chocolate -- hope I haven't missed the giveaway! Also, I love how you plan out your menus for the week. Everything sounds so delicious! Always up for chocolate, and free certainly doesn't hurt!